The ovaries are not the most common area of the pelvis to be involved by endometriosis, and almost all patients with ovarian disease will have disease in other pelvic or intestinal locations. Ovarian endometriosis is a marker for the presence of more severe pelvic and intestinal disease than exists in women without ovarian involvement . Thus, one of the most important clinical features of ovarian endometriosis is that if a surgeon treats only ovarian disease, then incomplete treatment will almost certainly have occurred. Sampson  postulated that endometrioma cysts might be due to invasion of a corpus luteum cyst by endometriosis from the ovarian cortex, while Russell  raised the possibility of embryonic Müllerian rests. Ovarian endometrioma cysts may cause symptoms by several mechanisms in some cases but not others. Cysts of any size may cause ipsilateral pain or no pain at all due to stretching of the ovarian cortex. If the ovary is encased in adhesions that are stretched by growth of a cyst, then pain may occur. If an ovarian endometrioma cyst leaks, the chocolate-colored fluid is a potential irritant to the pelvis, in which case, patients may have an acute episode of severe pain that declines over several days, or even to the diaphragm, in which case, chest or shoulder pain may occur. Because women with ovarian endometriosis usually have other disease present, it is difficult to determine the precise contribution of the ovarian disease to the constellation of symptoms possible with endometriosis. Superficial lesions of endometriosis on the cortex of the ovary appear to be asymptomatic. Superficial endometriosis of the ovarian cortex requires surgery for diagnosis. Ovarian cysts greater than 3cm in diameter can potentially be felt on pelvic examination in patients of normal weight, while cysts of any size may be identified by imaging tests which may also suggest the nature of the fluid. Surgical diagnosis is somewhat inaccurate, as it has long been known that a corpus luteum cyst can masquerade as an endometrioma cyst . 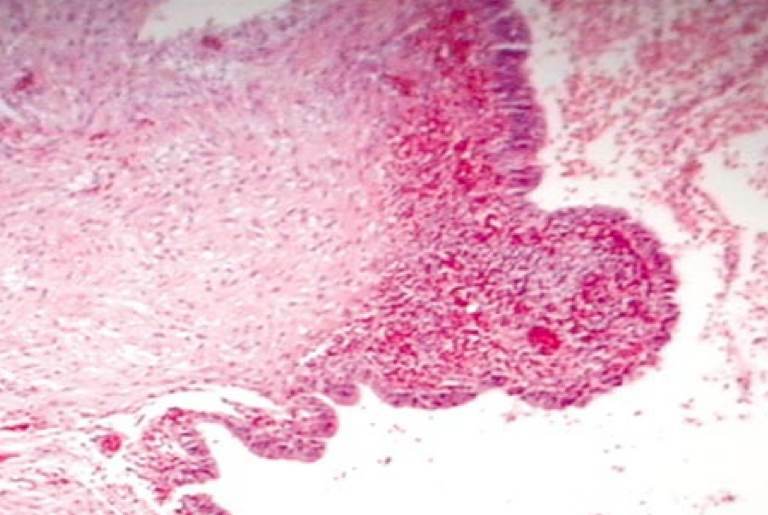 Histology ultimately supplies the most accurate diagnosis. Many endometrioma cysts are self-contained within the stroma and cortex of the ovary. 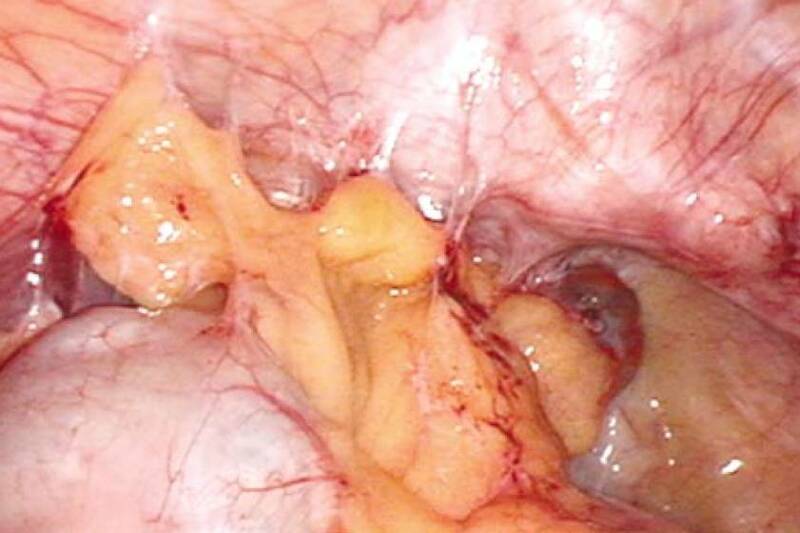 Some 'endometrioma cysts' are actually collections of bloody fluid trapped between peritoneum and an adjacent adherent ovary, with a portion of the cyst wall being the normal ovarian cortex which is sometimes involuted around the fluid pocket. The relative frequency of each of these types of ovarian processes is not known. What is known, however, is that neither process alone is responsible for all lesions which may be termed 'endometrioma cysts'. Endometrioma cysts do not respond well to medical therapy and surgery is the best treatment for resolution. Several surgical techniques are available. It is important that there are no obvious signs suggestive of ovarian malignancy before treating an endometrioma cyst. 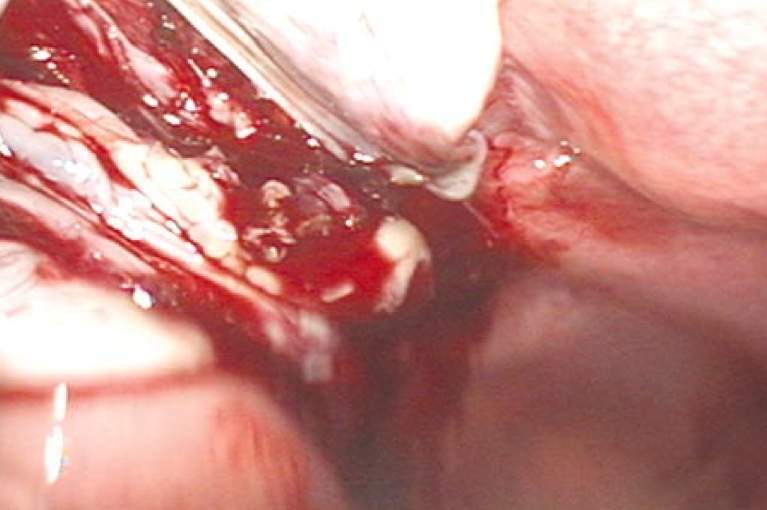 If doubt exists, a frozen section diagnosis during surgery may be helpful. 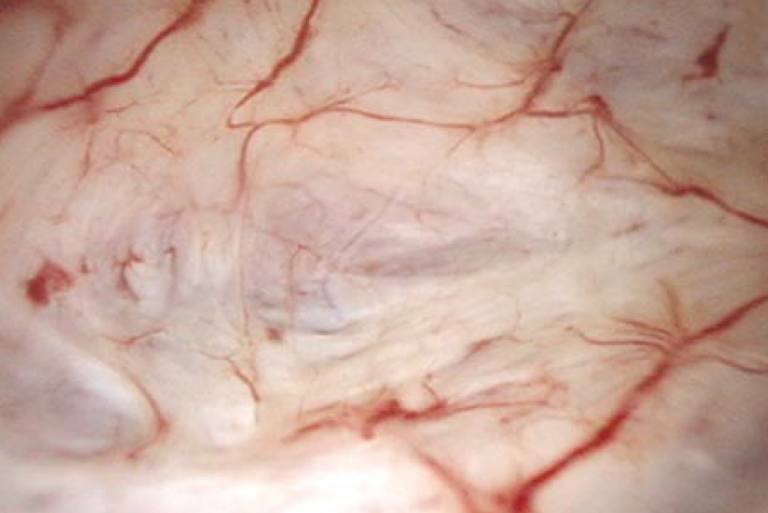 Superficial hemorrhagic adhesions may not be true endometriosis, and these are best treated by superficial desiccation by electrofulguration or similar mild ablative technique. 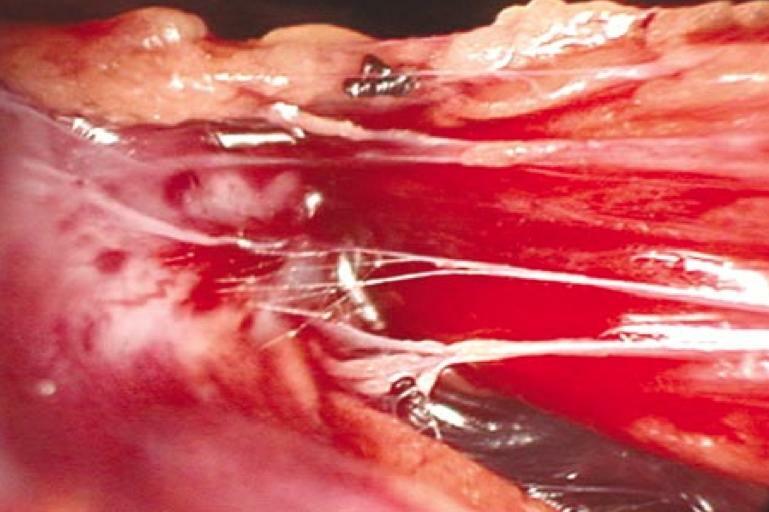 These adhesions will be seen to shrink rapidly when treated. Superficial lesions of endometriosis are typically less than 2cm in dimension and can be treated by laser or electrovaporization or cortical excision. Some apparently superficial lesions may be located over a deeper small 'chocolate cyst' which may or may not be an endometrioma cyst. 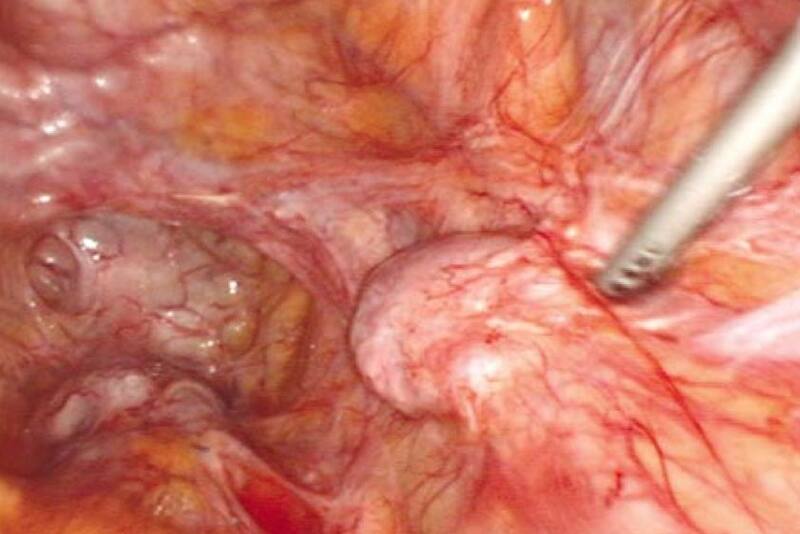 Endometrioma cysts can be treated by either ovarian cystectomy or draining and ablation of the cyst wall. Ovarian cystectomy is associated with lower rates of recurrence or persistence of cysts , since thermal ablation of the interior of large cysts to a consistent depth of complete destruction seems problematic. A convenient site on the exposed ovarian cortex is chosen (Fig. 1). Since these cysts are frequently somewhat immobile because of underlying adhesions to the sidewall or uterosacral ligament, there usually is little choice in where the initial incision is made. Creating the incision alongside the mid portion of the adjacent fallopian tube will keep the dissection away from the fimbriae and protect them from inadvertent surgical damage. After the cortical incision is made, the cyst wall is exposed and it is punctured in turn, with the inevitable escape of chocolate-colored fluid (Fig. 2). The bloody fluid is suctioned and the pelvis and interior of the cyst are rinsed with irrigation fluid. The cyst wall can be visually inspected and much of it will be seen to be smooth, flat and colorless (Fig. 3), with endometriosis present only in discrete areas in a portion of the wall (Figs 4 & 5). The cyst wall is then bluntly teased and dissected out of the ovarian stroma using two graspers. This is easy because frequently the cyst wall is fibrotic, which allows strong traction to be used during cystectomy. The healthy ovarian stroma is reddish in color compared to the greyish-white color of the cyst wall (Fig. 6). When the cyst is large (Figs 1 and 7) the topography of its removal can be confusing. As the cyst is extracted, the ovarian cortex can become inverted and pulled out of the incision site as well. It is important to maintain the cleavage plane which was initiated and to observe the medial side of the ovarian cortex to ensure that cortex is not being resected. 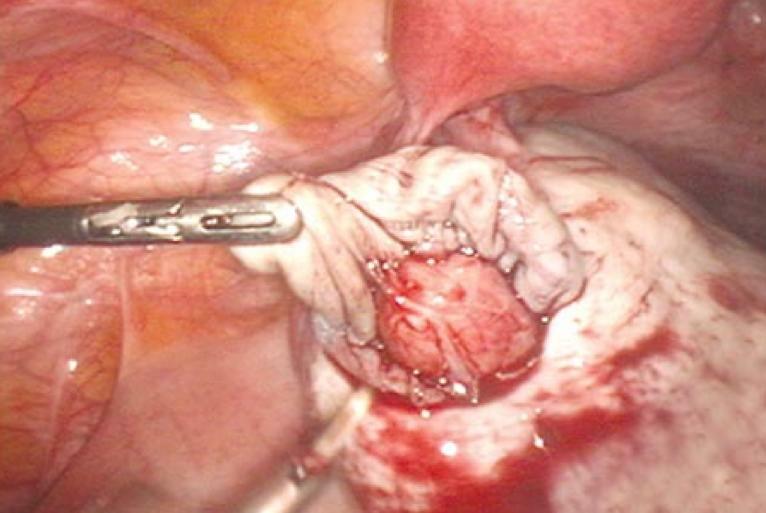 Many endometrioma cysts are densely adherent to the adjacent uterosacral ligament (Fig. 8), and this correlates with the area of the cyst which is most difficult to remove as the cyst wall is fused to the cortex and both are fused to the uterosacral ligament. 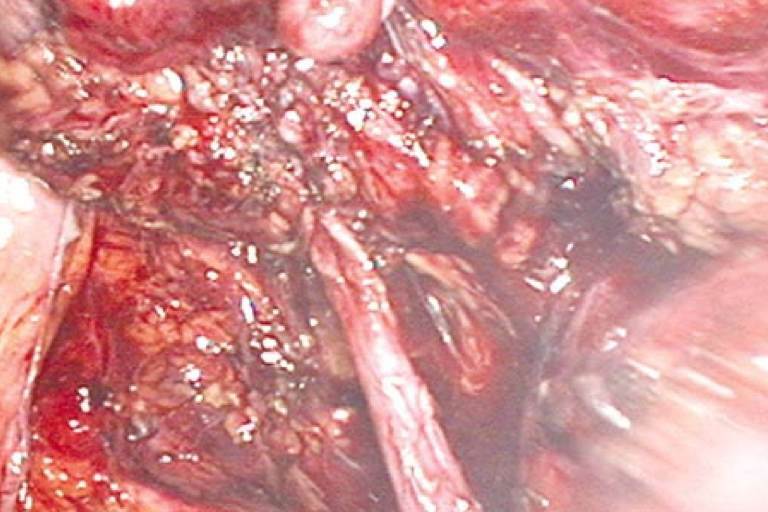 Continuing attempts at ovarian cystectomy through the initial cortical incision will be difficult or unsuccessful because of this area of mass tissue fusion. 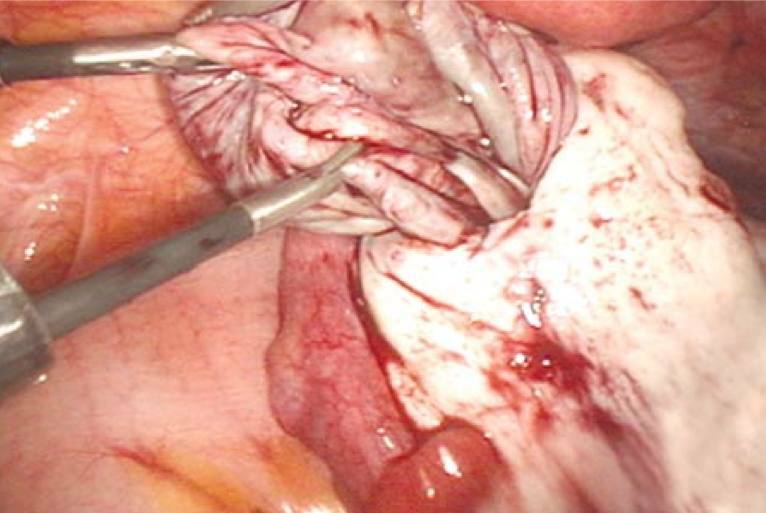 Once the surgeon realizes that ovarian cystectomy has reached a dead end because of this feature, it is frequently easier to attack the area of tissue fusion directly. The area of tissue fusion can be resected en bloc as one specimen which contains the uterosacral ligament, the area of the cortex adherent to the ligament, and the area of the cyst wall which is fused to each (Figs 9-11). This frees up the ovary considerably as well as the deepest part of the cyst wall which can now continue to be extracted easily. A large left ovarian endometrioma cyst is present. It is immobile because it is adherent to the underlying uterosacral ligament. This is not an ovarian pseudocyst after Runge/Hughesdon/Brosens. There is little choice of where to make an incision in the cortex. The incision obviously should not be made across the vessels of the mesovarium, and an incision too far around the side will be difficult to make and risks damage to the underlying bowel. A cortical incision has been made in an area which is en face to the visual axis of surgery. The incision has been carried down into the underlying cyst and watery chocolate-colored fluid is spewing out under pressure. The interior of the cyst is composed largely of a fibrotic lining with no endometriosis. Endometriosis will be present as punctate reddish papules in certain areas of the cyst wall. Microscopy of one of the reddish papules in Fig. 4 shows endometrium-like epithelium overlying a hemorrhagic stroma. The greyish-white ovarian cyst wall is bluntly dissected away from healthy normal reddish ovarian tissue. Large ovarian endometrioma cysts are easy to dissect out because the cyst wall is thick and fibrotic. At some point, however, progress will cease because the bottom of the cyst is fused to the uterosacral ligament. The left ovary is densely adherent to the left uterosacral ligament and the bottom of the cyst wall is fused at this point as well. This fusion of the cyst wall, ovarian cortex and uterosacral ligament is what will cause many easy cystectomies to become difficult. The fused, adherent part of the ovary is amputated from the remainder of the ovary. This allows the ovary to be freed up while the fused tissue is still attached to the uterosacral ligament for later removal with that ligament. This frame shows the beginning stage of this amputation process. The scissors have begun to make an electrosurgical incision across normal peritoneum just lateral to the left uterosacral ligament. The area of tissue fusion is held medially and anteriorly by the graspers in counter traction. 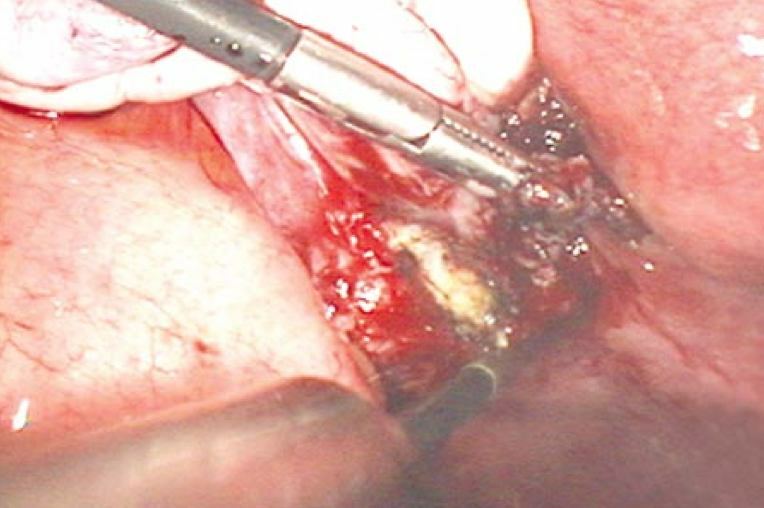 The incision across the left broad ligament continues until the scissors explore the normal retroperitonal space beneath the adherent ovary. The area of fusion is held by the graspers. The remaining attachments of the ovarian cortex and cyst wall are amputated from the area of fusion still held in the graspers. If the ovary is not adherent, there frequently will be a stellate scarred area of previous cyst leakage. This corresponds to the site of attachment to the uterosacral ligament if a cyst were adherent as described above. It is at this point that endometriosis of the ovarian cortex may be present. This cicatrix of the cortex should be removed with adequate margins into normal cortical tissue, similar in effect to the en bloc resection described above for the point of mass tissue fusion. This will allow the chocolate-colored contents of the cyst to escape. After suctioning and irrigating the released fluid, the cyst can be extracted through the opening that has been created. Sometimes the cyst wall will be difficult to grasp as it may remain somewhat fused to the cicatricial opening. In such cases, it is helpful to cut an incision into the normal cortex a few millimeters away from the opening. This provides a convenient traction 'handle' of normal cortex which allows easier entry into the plane between the cyst wall and the overlying cortex. If the ovary is adherent to the pelvic sidewall, the peritoneum hidden under the adhesions may harbor endometriosis. Retroperitoneal fibrosis immediately beneath the adherent ovary may invest the underlying ureter (Fig. 12), so difficult ureterolysis is sometimes necessary (Fig. 13). Surgery on the ovary combined with a sidewall dissection can produce dense postoperative adhesions which can cause the ovary to fuse to the underlying ureter, making reoperation more difficult. 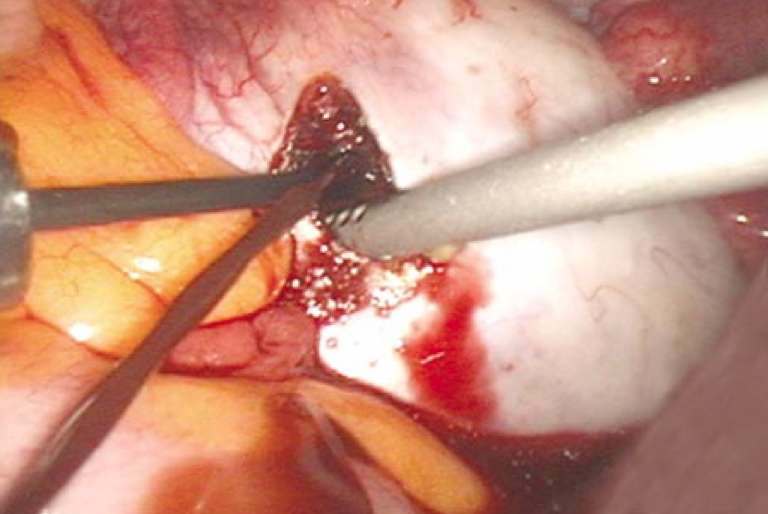 Suspending the ovary from the ipsilateral round ligament with a single suture of 3-0 Vicryl or similar small absorbable suture can keep the ovary from adhering to the sidewall (Fig. 14). The right ureter is seen in close-up view in the right half of the frame. Tendrils of light fibrosis bind the ureter to the under surface of the peritoneum on the left half of the frame. The peritoneum is thickened, although that is not apparent from the image. Not visible out of the frame to the left is an ovarian endometrioma cyst which was itself adherent to the peritoneum. The tendrils of fibrosis in this case are mild and scanty, so ureterolysis will be easy. Sometimes, the retroperitoneal fibrosis involving the ureter can be massive. In this case, the left ureter seems to proceed directly into a retroperitoneal mass of fibrosis and adherent, invasive ovarian tissue. 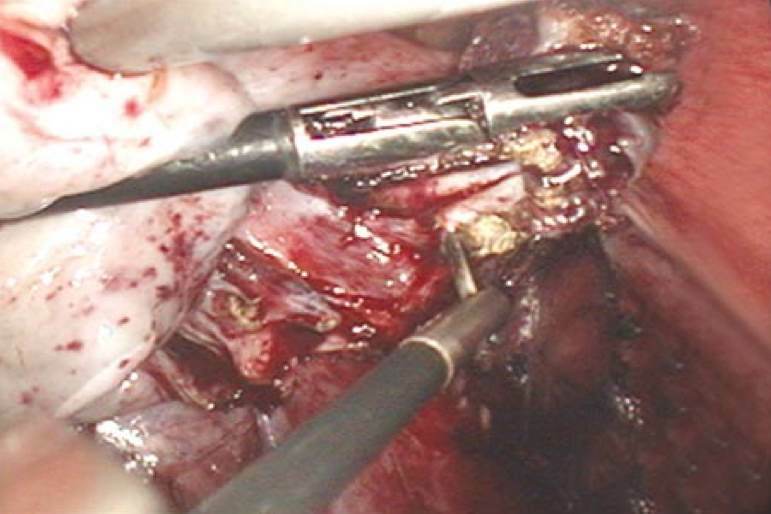 The left ovary has been suspended from the left round ligament using 3-0 Vicryl suture. A triangular hammock has been created so the ovary can be reconstituted and suspended with only one suture. A variant of an ovarian endometrioma cyst consists of the Runge/Hughesdon/Brosens pseudocyst, in which bloody fluid is trapped between the adherent ovary and the pelvic side- wall. 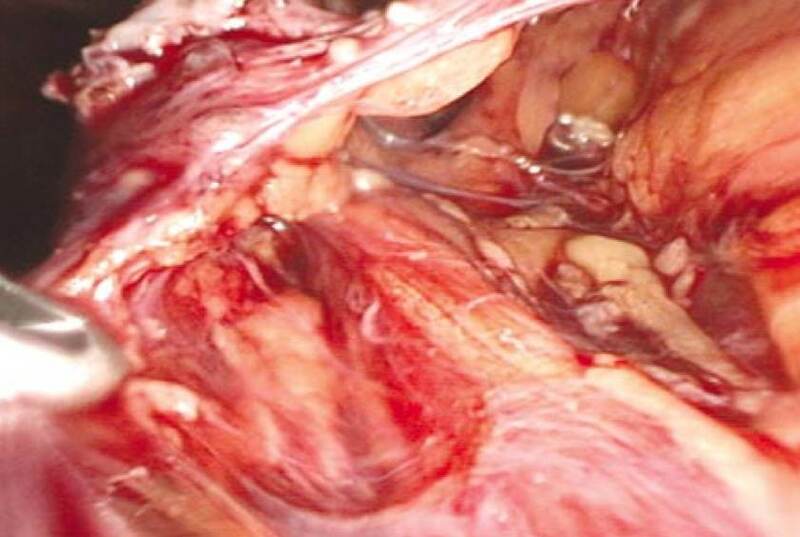 Continued production of bloody fluid by superficial endometriosis of the ovarian cortex causes accumulation of an increasing volume of fluid which is thought to progressively indent the ovarian cortex, resulting in a portion of the cyst wall being formed by ovarian cortex which is largely normal. The treatment of such a cyst consists simply of ovariolysis with freeing of the fluid and destruction of the areas of the cortex thought to represent endometriosis. The concept of formation of such a type of cyst is not new. Sampson  mentioned an earlier report by Runge from the German literature where this concept was proved by serial section study, which was later repeated by Hughesdon , with the topic recently championed by Brosens . It can sometimes be difficult to distinguish between these two morphologies of ovarian endometriosis, which can affect an intended conservative treatment. A proposed benefit of the Brosens treatment of an ovarian endometrioma pseudocyst is that it preserves oocytes and ovarian function and thus protects fertility. This protective concept has been rendered a somewhat moot point since investigators have found that women undergoing ovarian cystectomy for treatment of endometriomas have a response to gonadotropins that is identical to women with only tubal factor infertility , and others have found that the pregnancy rate is lower and the recurrence rate of cysts is higher if the ovarian cyst wall is not stripped out . Rarely, if a very large cyst or multiple endometrioma cysts are removed from an ovary, there will be but a paper-thin shell or shreds of cortex which may bleed and which is impossible to suture. In such a case, it may be best to perform a coup de grace and remove the remnant of ovarian tissue if the opposite ovary is salvageable. During difficult oophorectomy for removal of a densely adherent endometrioma, a portion of ovarian cortex may remain stuck behind to the sigmoid colon or pelvic sidewall (Figs 15 & 16). This remnant of tissue can remain viable despite absence of a normal blood supply and undergo stimulation by pituitary hormones and regenerate sufficiently to be a continuing source of estrogen production or cyst formation. Ovarian remnants can also be a cause of pain, either by stretching of overlying adhesions by a cyst (Fig. 16), or by stimulation of residual endometriosis due to estrogen production. Prevention of the ovarian remnant syndrome is identical to its treatment: retroperitoneal dissection, frequently with ureterolysis, will allow removal of peritoneum of the pelvic sidewall with the adherent remnant or ovary still attached (Fig. 17) . 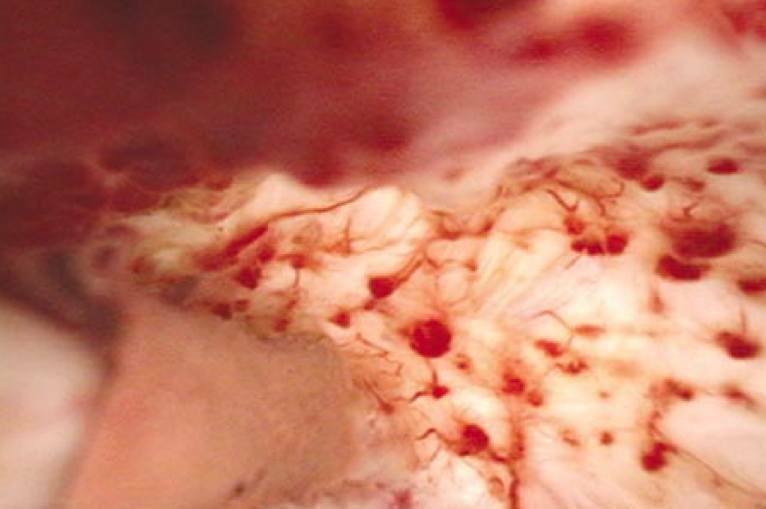 A cystic reddish ovarian remnant is seen adherent to the anterior sigmoid colon near the cul-de-sac. The suction irrigator points at an ovarian remnant of the right pelvic sidewall. Some ovarian remnants are endometriotic cysts. Retroperitoneal dissection beneath the ovarian remnant seen in Fig. 16. The right ureter is seen as it passes beneath the remnant, with retroperitoneal fibrosis binding it to the undersurface of the peritoneum immediately beneath the remnant. Ureterolysis will be necessary in such a case. Redwine DB. Ovarian endometriosis: A marker for more severe pelvic and intestinal disease. Fertil Steril 1999;73:310-15. Russell WW. Aberrant portions of the Muellerian duct found in an ovary. Johns Hopkins Hosp Bull 1899;10:8-10. Fayez JA, Vogel MF. Comparison of different treatment methods of endometriomas by laparoscopy. Obstet Gynecol 1991;78: 660-5. Hughesdon PE. The structure of endometrial cysts of the ovary. J Obstet Gynaecol Br Emp 1957;44:481-7. 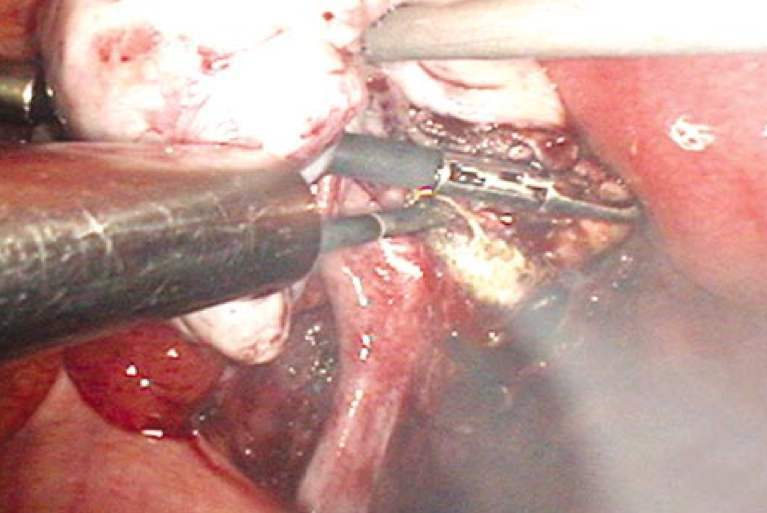 Brosens IA, Van Ballaer P, Puttemans P, Deprest J. Reconstruction of the ovary containing large endometriomas by an extraovarian endosurgical technique. Fertil Steril 1996;66:517-21. Marconi G, Vilela M, Quintana R, Sueldo C. Laparoscopic ovarian cystectomy of endometriomas does not affect the ovarian response to gonadotropin stimulation. Fertil Steril 2002;78:876-8. Beretta P, Franchi M, Ghezzi F, Busacca M, Zupi E, Bolis P. Randomized clinical trial of two laparoscopic treatments of endometriomas: cystectomy versus drainage and coagulation. Fertil Steril 1998;70:1175-80. Rana N, Rotman C, Hasson HM, Redwine DB, Dmowski WP. 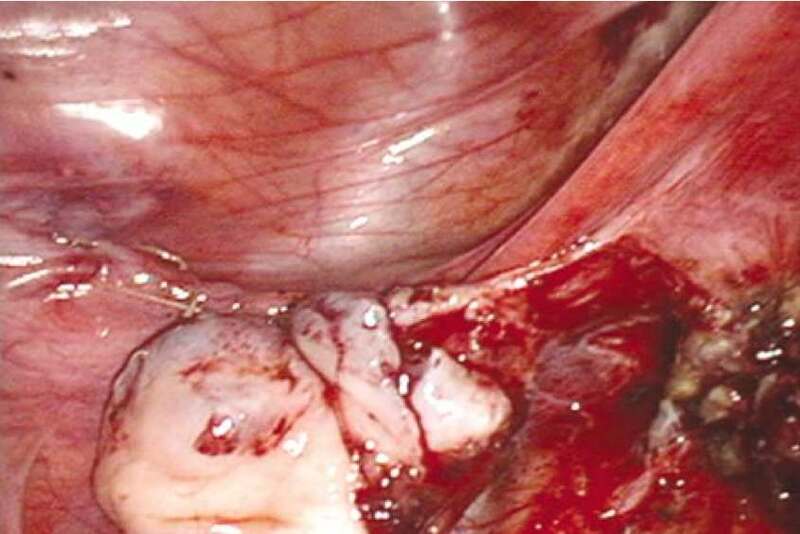 Ovarian remnant syndrome after laparoscopic hysterectomy and bilateral salpingo-oophorectomy for severe pelvic endo- metriosis. J Am Assoc Gynecol Laparosc 1996;3: 423-6.